While Democrats push for a ban on guns, Republicans push for an increase in the ban on drugs, and both sides ignore the fact that they are pushing for Americans to give up essential freedoms in exchange for an even larger Police State. When Democrats called for gun control last week, Republicans insisted that simply placing a “ban” on certain weapons would not stop mass shootings. This week, Republicans are coming out in support of President Trump’s plan to push for stricter punishments—including the death penalty—for drug dealers, proving that the “ban” on drugs has not worked and the false “left vs. right” paradigm is being used once again to create a hypocritical divide that will only lead to more government. Their direct target was the Armalite AR-15 rifle, which was reportedly used by suspected gunman Nickolas Cruz to shoot and kill 17 people at a high school in Florida on Feb. 14. While there were a number of other glaring factors that contributed to the attack, such as the psychotropic medication Cruz was taking, the dozens of calls to Cruz’s home that were ignored by police, and the multiple credible reports that were ignored by the FBI, the focus has instead been on the weapon Cruz used. When the calls for a complete ban on “assault weapons” as politicians and the media have branded them, did not work, the focus shifted to pushing for an increase in the age requirement to purchase a gun. Trump did show support for pushing for more government agencies to submit records to the National Instant Criminal Background Check System, which would result in more individuals losing their Second Amendment rights for infractions unrelated to violence, and before they had ever had their day in court—a dangerous measure supported by both Democrats and Republicans. After refusing to support a ban on guns and a ban on 18-year-olds purchasing guns, knowing it would have little effect, Trump is now pushing for an increase on a ban that has failed miserably and has cost American taxpayers an exorbitant amount of money over the years—the ban on drugs. Trump’s new plan to combat the opioid crisis—which arguably would not exist if the War on Drugs did not exist—will give more power to the police state and will include stricter punishments, which could go as far as approving the death penalty for drug dealers, according to a report from Politico. The calls for stricter punishments for drug dealers are receiving the support of many Republicans who do not understand why the War on Drugs has failed or how it has corrupted the justice system. “I haven’t looked at it relative to the president’s proposal, but I have looked at it over the years with the frustration that U.S. attorneys sometimes face where they can get a whole bunch of the henchmen for murder, but they can’t get the kingpin for something that’s more than you know, 20 years, 10 years, or less,” Republican Rep. Darrell Issa told the Weekly Standard. 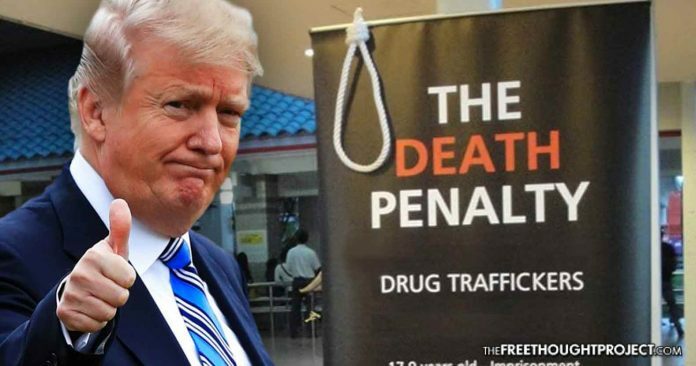 Trump is also not the only one who supports the death penalty in drug cases—some members of Congress are actually considering it as a legitimate idea. Republican Rep. Chris Collins told Politico that he fully supports the idea. The idea that a ban on guns would prevent all mass shootings is the same as the idea that a ban one drugs would prevent all future drug use. Citizens are not robots, and just because the government deems something “illegal” does not ensure that every individual will comply with the new laws. In fact, the ones who do comply and give up the guns they were using to protect their homes are often the ones who experience the most harm when the ones who do not comply come to rob them. All Trump had to do was look at the state he considers his good friends in Saudi Arabia to see how ineffective killing people over drugs is. As Drugabuse.com notes, the sale of drugs in Saudi Arabia almost always results in the death penalty. Saudi Arabia and judicial authorities are not inclined to make exceptions. Alcohol use is illegal in Saudi Arabia, and possession or use of alcohol or drugs can be punished by public flogging, fines, lengthy imprisonment, or death. In spite of Saudi Arabia killing countless people for ingesting and selling substances deemed illegal by the state, an ever-expanding epidemic of drug addiction and overdoses currently grips the country. Both Republicans and Democrats will attempt to persuade the public that they should ban guns or increase the ban on drugs because it keeps citizens safe and prevents death. But while they are busy using an emotional plea and trying to sell the public on the short-term results of their plans, they fail to mention the long-term consequences, which will result in citizens becoming less safe and having less freedom because they surrendered their most essential rights with the false belief that it would increase their safety.